In order to reap the full benefits of DevOps, organizations must integrate software testing into their continuous delivery pipelines, rather than keep software tests inside a silo. The software testing solution they choose should be highly automated, scalable, secure, and able to support fast, on-demand testing. Automated testing is the key to successful integration of quality assurance into DevOps workflows. It is the only way to ensure that quality assurance is as continuous, agile and reliable as the rest of the DevOps operation. 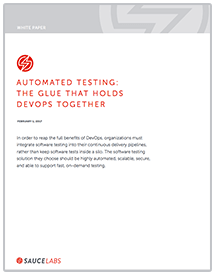 In this sense, automated testing serves as the glue that binds together all of the other processes that comprise the continuous delivery pipeline. Without automated testing, DevOps just doesn’t work.